A*STAR’s (Agency for Science, Technology and Research1) Institute of Microelectronics (IME), is collaborating with ROHM Semiconductor, a leading semiconductor manufacturer for the joint development of an artificial intelligence (AI) chip to boost efficiency in predictive maintenance for smart factories. The concept of ‘Predictive Maintenance’ has become widespread in the manufacturing industry as manufacturers begin to digitalise their production lines for increased productivity and competitiveness. Predictive maintenance involves forecasting machine failures, through monitoring the function and health of machines. Potential problems are identified based on data received through device logs and sensors, so that timely counter-measures can be taken, such as repairing or replacing the affected machine. In order for any machine abnormality to be detected throughout a production line, diverse amounts of data gathered from multiple sensors are first transmitted over a wireless network to a central computer server for processing and analysis. However, bandwidth constraints would arise in the Wireless Sensor Networks (WSNs), as the number of sensors increases. This would hinder the expeditious transmission of increasingly large volumes of sensor data to the computer server. In combination with the Internet of Things (IoT), AI is becoming a key enabler for predictive maintenance and performance improvement. The AI chip being developed by ROHM and IME will be able to process and analyse data as soon as they are received at the sensor node. This significantly reduces the amount of sensor data that has to be transmitted wirelessly to a central computer server for them to be further processed and analysed. The research collaboration will leverage ROHM’s original AI analytical algorithms, and IME’s capabilities in ultra-low power analog/digital integrated circuit and systems, as well as analog computation circuits developed by both parties. This will enable the developed chip to filter volumes of data across multiple sensors, and analyse complex data patterns in real-time. The AI chip is expected to perform significantly faster than the conventional method for predictive maintenance and help reduce power consumption, paving the way for greater asset productivity and lower overall maintenance costs. ROHM has plans for the AI chip to be compatible with wireless technologies such as Wi-SUN, and EnOcean3, and incorporate the chip into its proprietary sensor nodes and wireless modules. “I’m exceptionally delighted that we have our first opportunity for cooperative research with A*STAR’s IME. Through the fusion of ROHM’s sensor technology, analog low-power technology and AI architecture with IME’s capabilities in low-power integrated circuit technology, we want to provide the optimum solutions for edge nodes”, commented Mr Koji Taniuchi, Fundamental Research and Development Division, General Manager at ROHM. 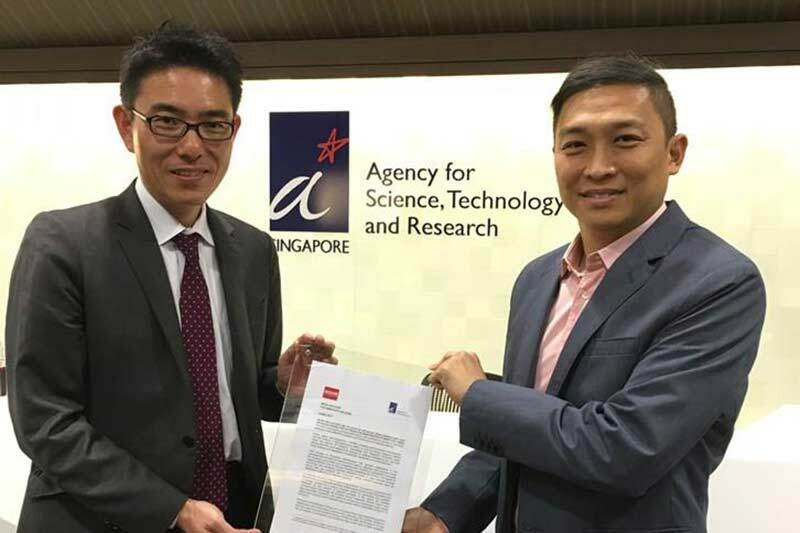 1A*STAR is the lead public sector agency in Singapore for mission-oriented research that advances scientific discovery and technological innovation. 2 Wi-SUN is a leading global industry alliance promoting interoperable wireless standards based solutions for the IoT. It offers the advantages of high reliability and long-distance communication using lower power than wireless LAN (Wi-Fi). 3 EnOcean is a battery-free wireless communication standard that uses energy harvesting technologies to collect slight amounts of energy, such as from light, temperature, vibration and so on, and convert it into electrical energy.